A different way of doing business…. Sometimes we are struck by the little differences we see living here in Italy as opposed to when we lived in England. The barter system is very much alive and living in rural Umbria. The longer we live here, the more we see of this very sensible exchange. Nothing is perfect – as with all systems – the Italians seem to believe that all exchanges should result in a swap of goods, usually with the giver getting even more from the givee! Unfortunately this seems to run to when actual gifts are given – for birthdays for instance – give a little token gift for someone’s birthday and be prepared to be given a gift right back at you! Same for celebrating the birth of a friend’s baby… We took a little gift to some friends for the birth of their first baby and left a couple of hours later, full of cake, ice-cream and with a fine bottle of Sagrantino! Many times we’ve been guilty of sneaking up to our friends front doors and leaving gifts for them on the door-step – just so that we can give without being given to! However, when the barter system is used for a bit of work – that’s a different matter! 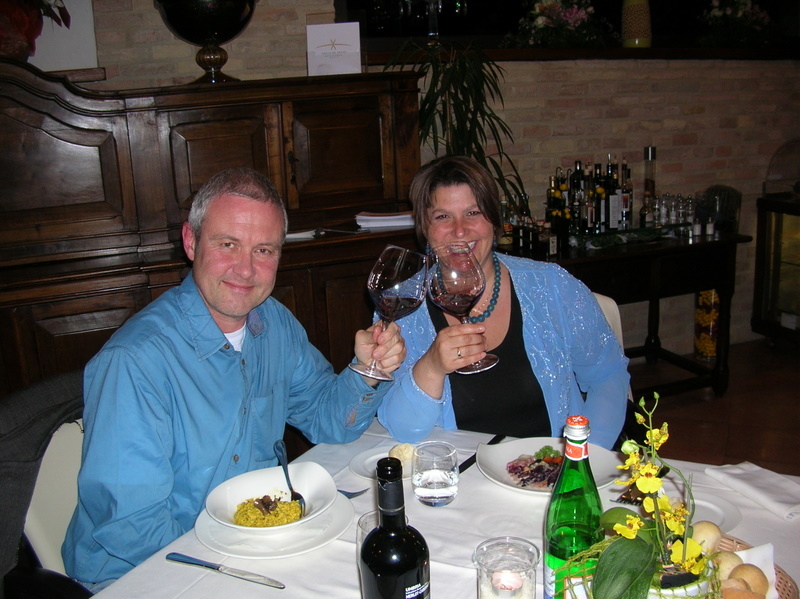 Mark did some translation work for the descriptions of the wines of Valle di Assisi a while back and decided that a meal for two in their elegant looking restaurant – Recanto – would be a perfect payment for the work. So, finally, last night we got dressed up and headed to Valle di Assisi on the road between Santa Maria degli Angeli and Tordandrea. The hotel is new and very well appointed with a mixture of modern and antique with, we couldn’t help noticing, gorgeous Persian rugs scattered almost carelessly around the foyer! When we asked at reception where the restaurant was, we were guided back outside again and given a map! The restaurant was not even visible from the hotel! So, fairly large grounds then, we thought! Luckily for us, as we approached the car again to drive to the restaurant, a man came up to us and asked if we were going to the restaurant and if so, could he hitch a ride with us – sure, do you know the way, we ask – Of course, he says, I’m the owner! So Giampiero Bianconi hopped into our little English Peugeot 306 and guided us to the right place! Mark had been dealing with Giampiero’s daughter, Susanna, regarding the wine descriptions. We hoped we’d see her at the restaurant but according to her dad, she’d had a very long day and was at home! Ah well, perhaps she’ll read this! We sat so that we could check the room out while eating! 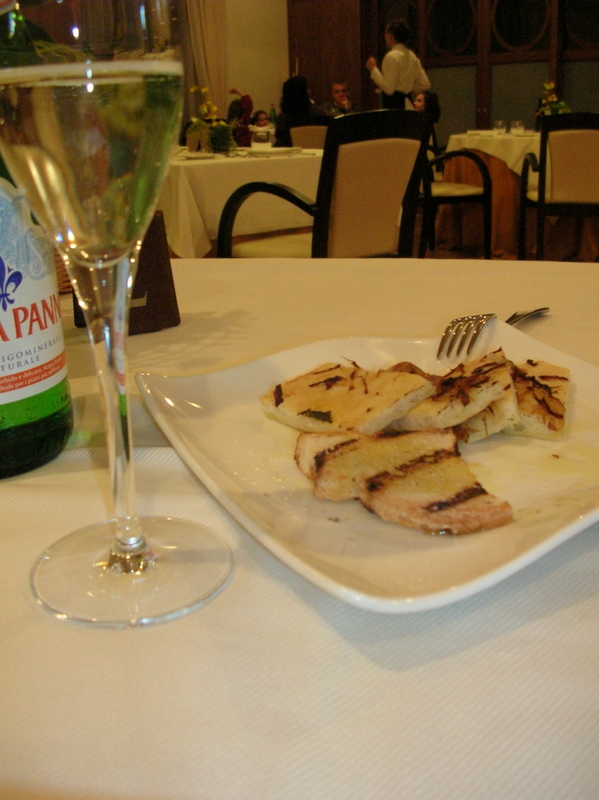 The young waitress bought us some delicious Prosecco to drink with some bruschetta and some onion covered pizza bread while we looked at the menu. As we don’t really like the ‘fizzy’ stuff, we surprised ourselves by enjoying this Prosecco! 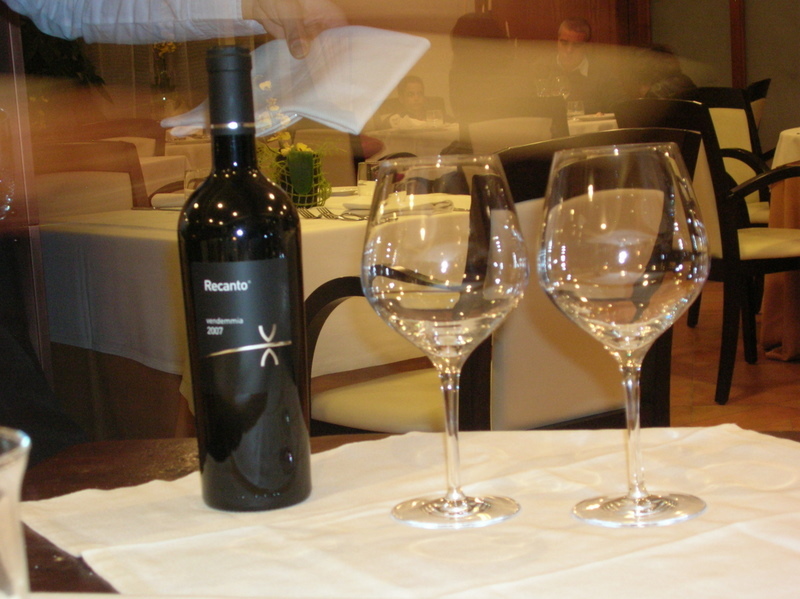 We chose their very good Recanto (same name as the restaurant) a 50-50 blend of Merlot and Cabernet. Big without being over-powering, very smooth and perfect for the dinner we chose. 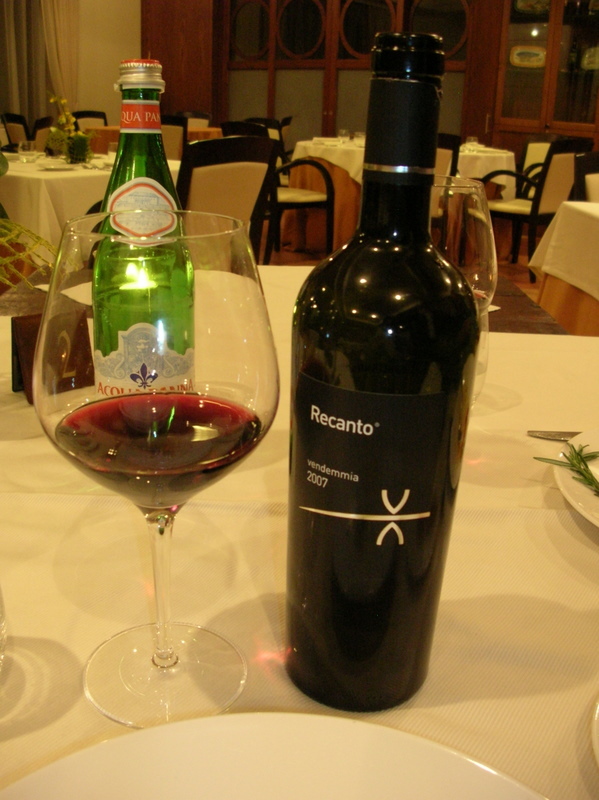 2007 Recanto - Rosso del Umbria. 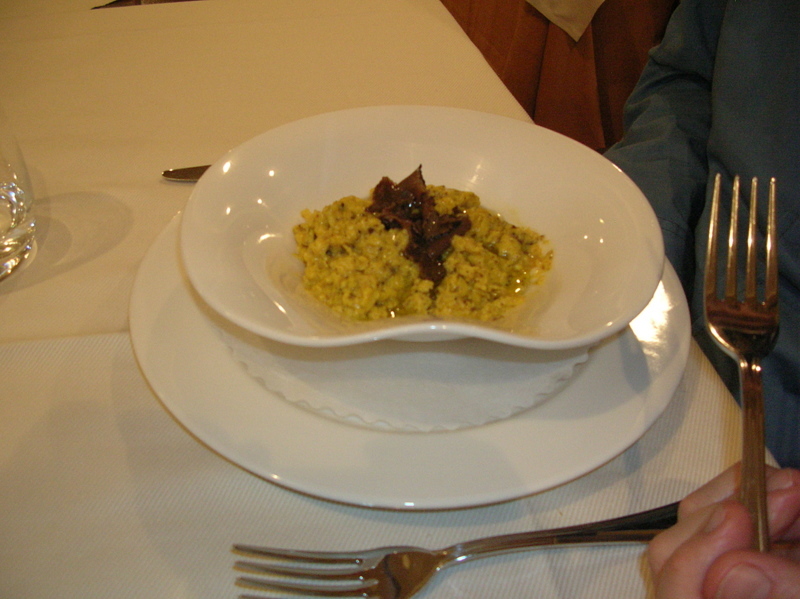 Finally, we made our decisions and Mark started with a bowl of creamy scrambled eggs topped with shavings of Norcia black truffles. I chose stuffed radicchio rolls with lardo di Norcia and Taleggio cheese inside. Both delicious! 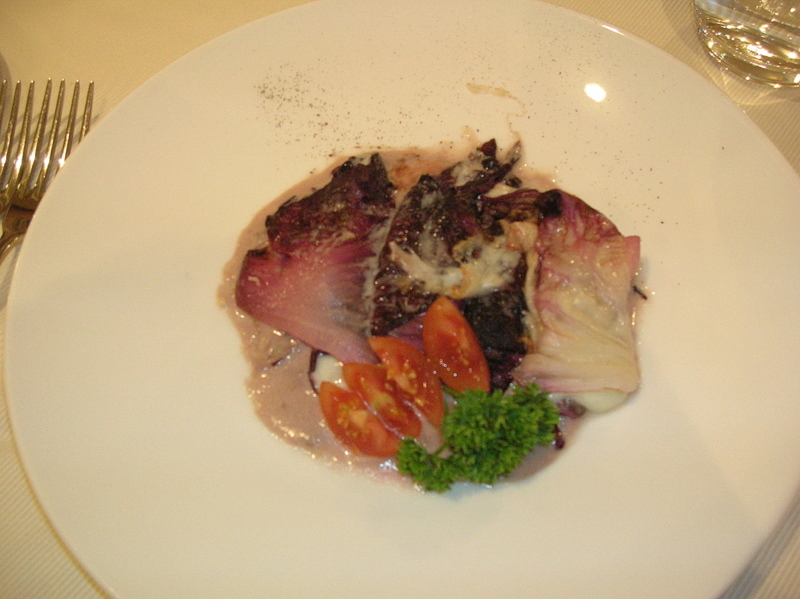 We had to get my little mobile Ita-Eng dictionary out for Mark’s dish, we’d asked the waitress what it was and she said it was a type of meat – yes, but what type? we ask …. Um, I can’t explain she replies! Turns out it’s young deer – yes, Mark ate Bambi! 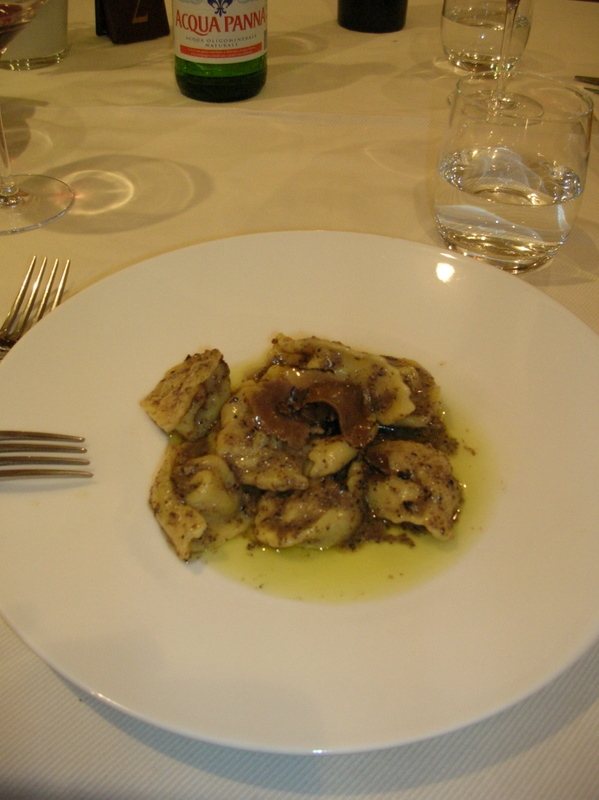 I was a tiny bit disappointed in my choice – Cappaletti filled with ‘meat’ with a Norcia truffle sauce. They were a bit dry and rather too al dente for my taste. But the sauce was very good indeed! 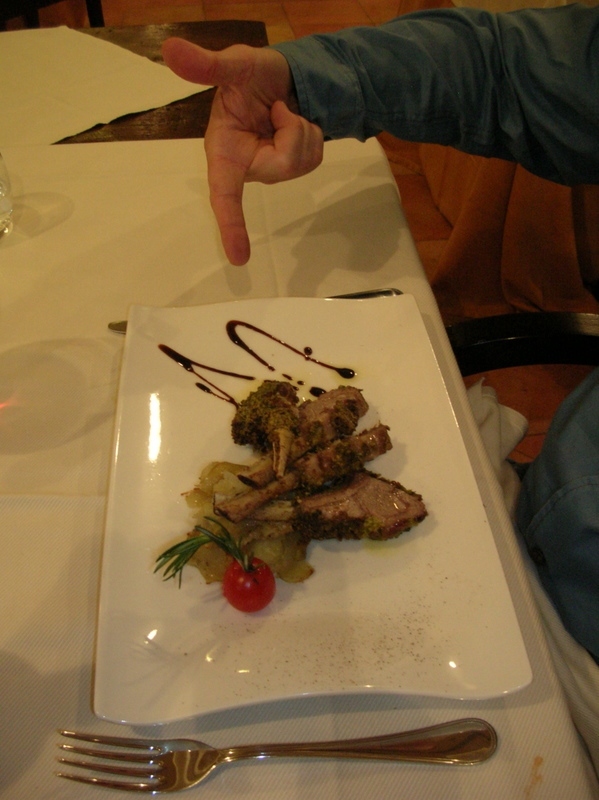 Mark – always a sucker for lamb, chose the lamb cutlets with a pistachio crust with a side of sliced roasted potatoes. 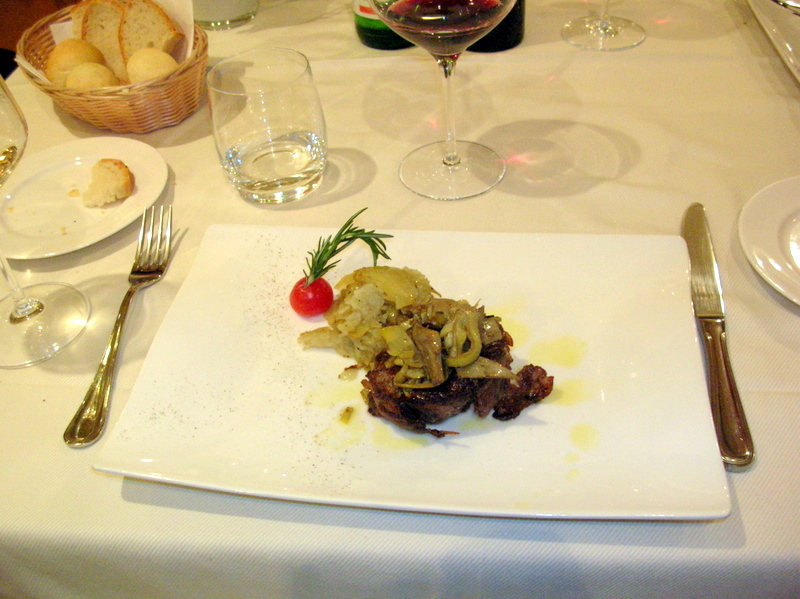 My choice was ‘off menu’, one of the specials of the day, a braised beef steak topped with crispy artichokes and served with oven cooked potatoes. Beautifully pink in the centre, so perfectly cooked for me! The wine went very well with this course. Giampiero and his wife Liliana were having their dinner at the table next to ours and he offered us a taste of the 2007 Grechetto they were both drinking. Again, their own production. Not pure Grechetto, but a little note of Viognier grape as Giampiero decided that this blend worked well together. Very citrus led, a bit too sharp for our personal taste, but a good summer wine. It was a close run thing with our competitive streak as far as what we order goes… Mark’s hot chocolate and almond souffle with a side of physilis fruit and chantilly cream ALMOST beat my home-made creme brulèe with grilled caramelised strawberry, kiwi and banana – but I think I pipped him at the post! 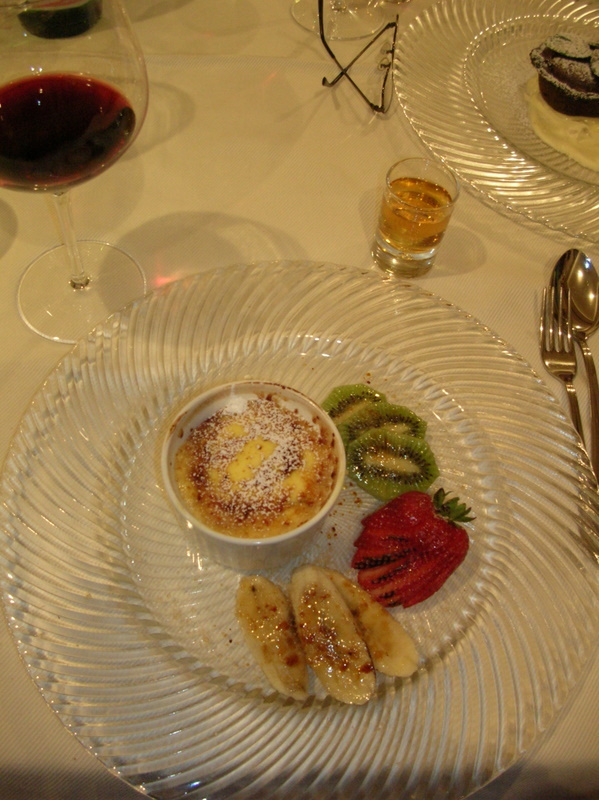 Creme Brulèe con frutta caramelizzata - TOO good! All in all a lovely meal. It just missed being superb – it wasn’t busy but the waitress was struggling to keep up with 3 tables. 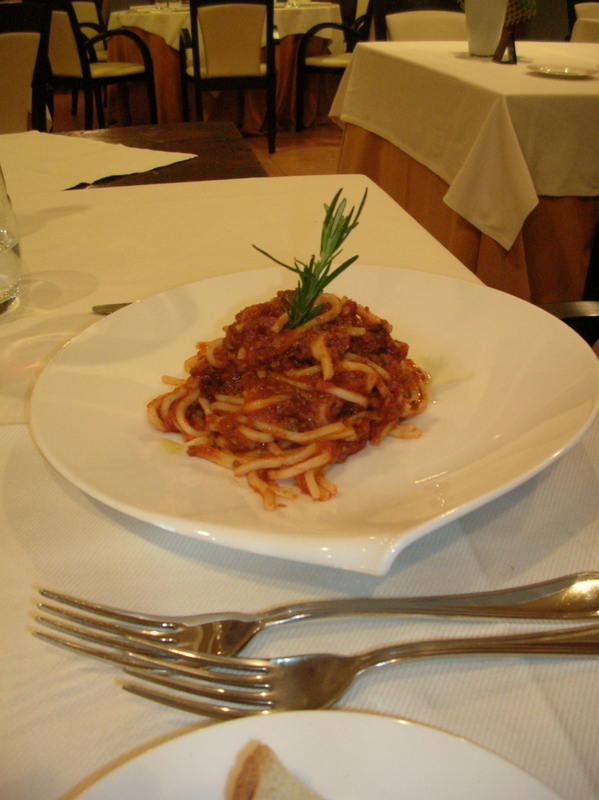 My pasta was too al dente, Mark’s lamb was the tiniest bit overdone – not pink at any rate. We’d ordered greens to go with the mains, they didn’t turn up (We decided not to say anything because we knew we would be too full if they did arrive!) 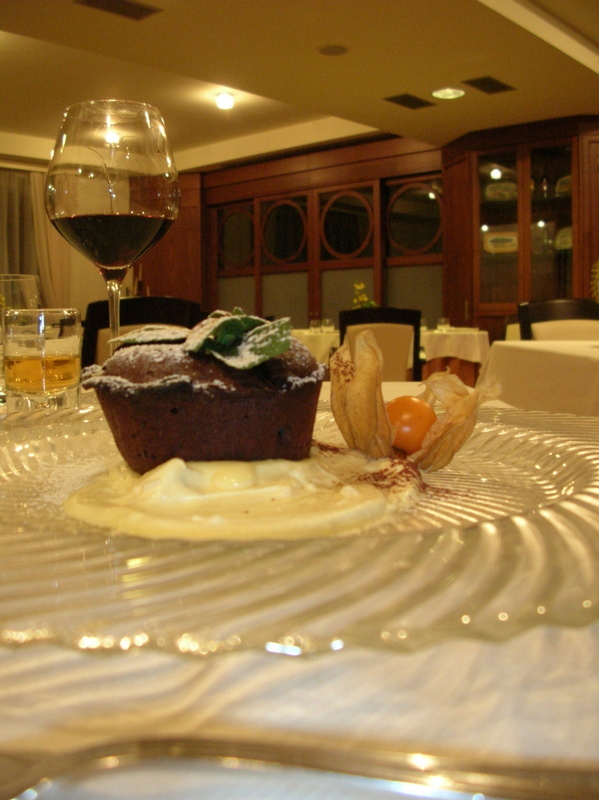 On the bigger plus side, the setting is lovely, the staff very attentive, the wines were good, and my main course was a different combination that worked very well. And the owners are delightful! I have to put a p.s on this blog (and it goes for all the others) Why doesn’t the actual blog look like the draft? Why can’t you just have it EXACTLY how you want it?? Answers below please. So what I’m trying to say is sorry it looks SO messy, but it’s the program, not me! « A wonderful Spring day for a Gusto Wine Tour! Sounds like a great evening Giselle – good payment for some work _ i@m a great believer in the barter system which is catching on all over now apparently. Ah Sue, it certainly is a great way to live! 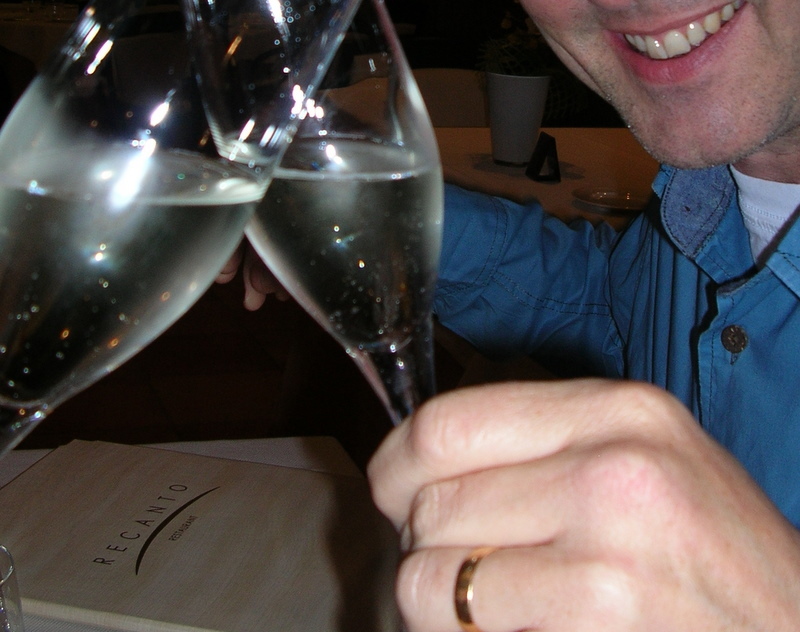 It worked out really well for us and we even tried a Prosecco that we liked – we were both amazed! Hahaha! Do you remember where you ate? If you’re in Umbria again, look us up! Cheers for your comment, much appreciated!